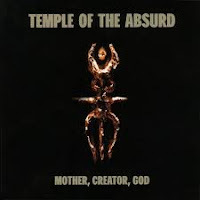 Temple of the Absurd's debut was met with mixed reactions, as can happen when a member of a generally well regarded metal act (in this case Holy Moses) starts anew with a different project. In my opinion, the album faltered due to its close proximity to the constituent members' prior efforts, inserting only some sloppy and underwhelming psychedelic elements that were not enough to save the sub-par riffing and writing. With Mother, Creator, God, the band's second offering, the band had clearly established a distinct identity for themselves without wholly abandoning their repertoire. The sophomore incorporates a lot of groovy rock elements, wa wa guitars via Alice in Chains or Black Label Society, and they take a few more risks, some of which are sadly detrimental to the album's overall impact. Basically, the album is an accessible grunge-a-like with the novelty of Sabina Classen's vocals. Imagine Facelift with brutal vocals instead of Layne Staley, and a couple rushes of punk and groove metal, and you might be somewhere in the vicinity of this. I realize that to many this must sound atrocious, but strangely it works in a few of the tracks. "Liebe toetet langsam" has a lot of swagger, and the slovenly vocal spatter serves well atop the stride of the guitars. The same could be said for "A Feral Creature" or the more moody "Alptraumkind". Then there's the atmospheric, folksy glint given to "Requiem for Misanthropy". But then there's another side to the album which consists of pretty dull stomping punk-groove like "The Mate" or "One Step". But what's worst of all is the decision to include several rap passages in the vocals of "Baba Yaga" and the cover of Jethro Tull's "Locomotive Breath"... I've said a number of times that I have no opposition to rap mixed in rock or metal if it's done well, but here it's used fully to the disadvantage of the music, and makes Temple of the Absurd seem like another of those branching, 'diverse' 90s failures. Granted, we are only speaking of a few passages, and the majority of the album is void of such folly, but then, neither is any of this material really 'good'. With some further gestation, a few of the album's better tracks might have become something truly interesting, but it seems every time the band really finds their groove they insert some less appealing component into a song. And if it took four years to come up with this, well then it would have been unlikely to improve. I think in the end, despite its weaknesses, Mother, Creator, God is a superior effort to Absurd, because it's mixed better, and just sounds more cohesive and catchy as a whole. Alas, it's still got an air of scatterbrained incompleteness about it, and I for one was not surprised when Sabina decided to return to her alma mater Holy Moses and re-launch it with a new lineup.